Yamaha have hit the nail on the head with the XSR900. It looks great with its on-trend retro styling and, thanks to Yamaha’s extensive catalogue of accessories, is easy to personalise too. It’s both versatile and fun with everyday usability, very impressive for a bike that comes in an affordable price bracket. 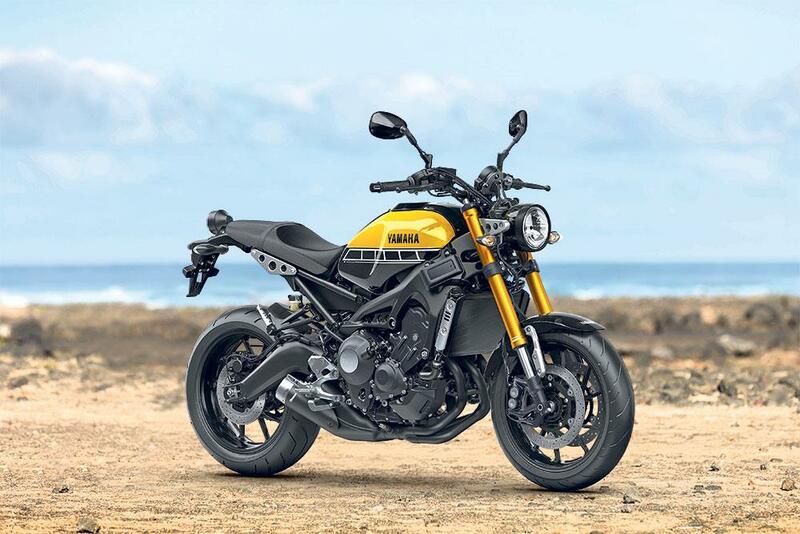 The inline triple has come from the highly popular MT-09, with revised fuelling map and also comes with the added benefit of traction control and ABS as standard. The handling is as good as it gets for a bike straight out of the box. 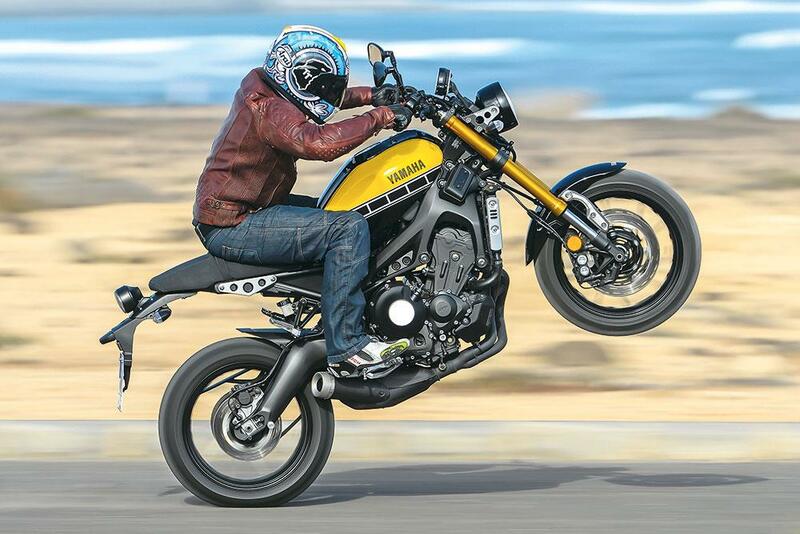 The XSR is stable, with impressive feedback and mechanical grip. It’s hard to find any fault with it at all. It runs the same shock and forks as the MT-09, but with different springs and settings to manage the different riding position and weight. It doesn’t have the Supermoto feeling of the MT-09, nor does the front end platter like the Tracer’s when you push it. The motor is the same 847cc Triple that features in the MT-09, producing the same power of 115bhp at 10,000rpm and 64.5ftlb’s of torque at 8,500rpm. Yamaha have also made improvements on the fuelling, which was always a weak point in the original MT-09 and is now nearly perfect. 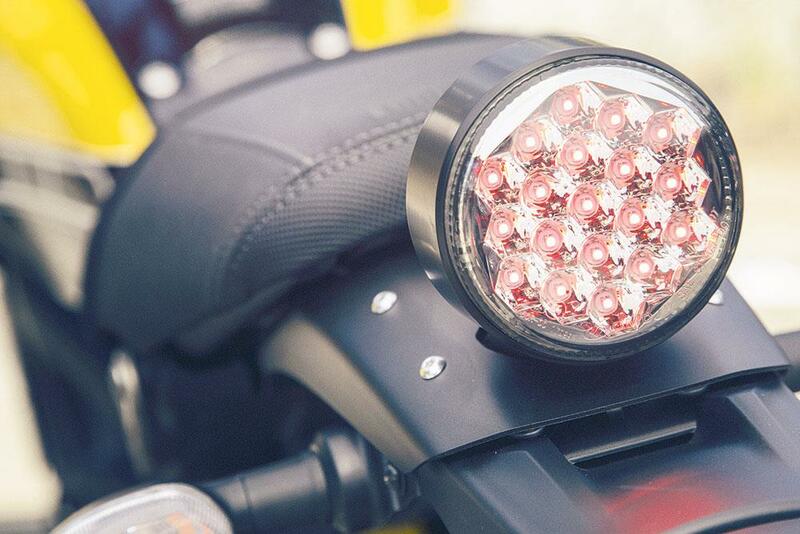 Despite its relatively low price, the XSR900 is built to an exceptionally high standard. The brackets, fuel tank and clocks are all made from aluminium and not plastic, further adding to the quality feel that this bike ozzes, even the bolts used on the bike are personal to this model. The XSR900 represents incredible value for money. It uses the MT-09’s brilliant triple engine and has put it in a machine that is bang on trend offering a brilliant bike at an exceptionally good price. It really is hard to see where Yamaha have saved on cost with this machine. 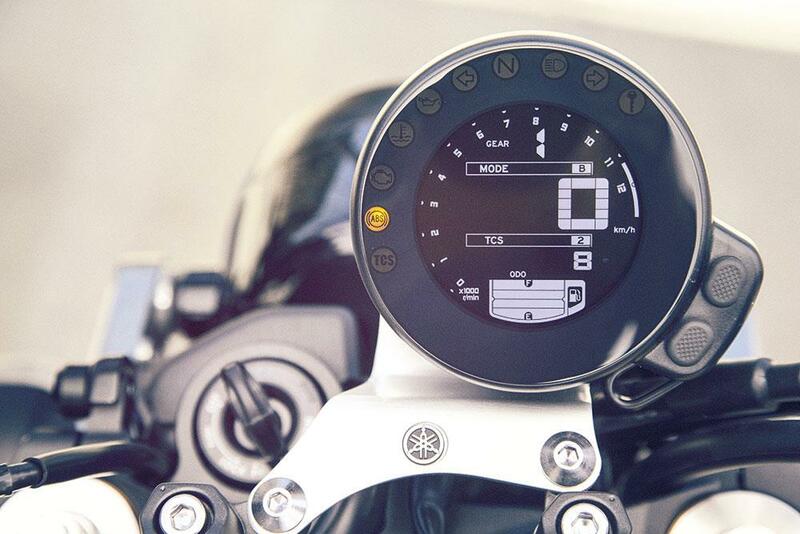 The XSR900 comes with ABS and Traction Control as standard. There are three rider modes to compliment this, A, Standard and B, which change the throttle response but not peak power. There are also two levels of traction control, that can be changed on the move with the trottle closed or can be deactivated completely with the bike in neutral and at a standstill. 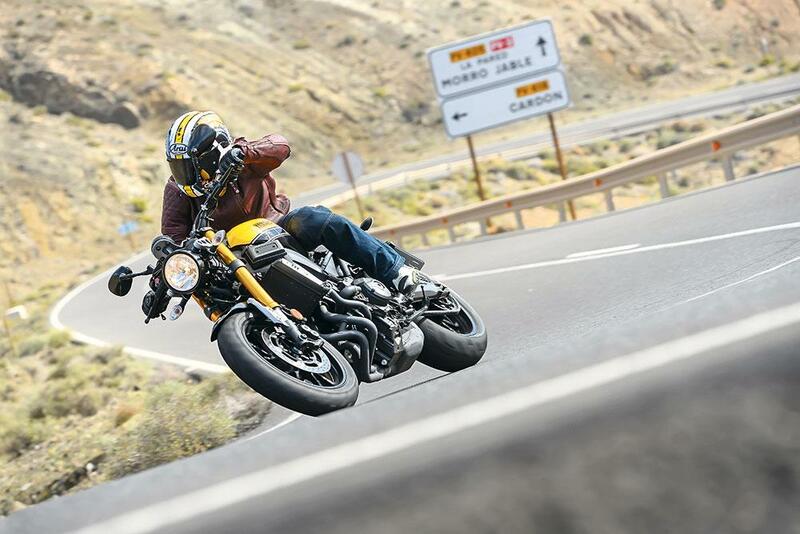 8 owners have reviewed their YAMAHA XSR900 (2016-on) and rated it in a number of areas. Read what they have to say and what they like and dislike about the bike below. The XSR900 is a lot of fun in daily use. I've done the NC500 and a bit of island hopping on two occasions, Wales a few times and up to the Lakes & Dales and found that it really needs a bigger tank. From the outside it looks fine but only holds 14 litres whereas this needs to be at least 17-18 litres. I've had issues with starter switch sticking and had two replaced now. I'm unsure what will happen after the warranty runs out, is this classed as an inherent fault? Best all-round bike in 30 years. Brakes are fine. Not Brembo sharp but more than sufficient for the bike. More progressive than immediate. The suspension it where this bike can be a let down. I personally found the shock to be too stiff for my 78kg and at high speeds on rough B roads it could get out of shape. I upgraded the suspension which has transformed the handling for me. Even factoring the cost of the upgrades the overall cost of the bike is better than the competition. Riding position is all day comfortable and a little less focused than say a Striple so big miles are easily achieved. I have put some SW Motech Legend bags on mine and it really has become as versatile as a sports tourer. An OEM fly screen adds a tiny bit of wind protection but I prefer the clean air of a naked over the buffeting of a fairing. Quite simply the best engine I have every owned. Singles, twins, in-lines I've had them all but for all day usability on every type of road then, for me, it's perfect. Considering the price this is built to a really high standard. I have ridden mine through two winters now and with ACF50 it still looks good. A little furry on the banjo bolts and discs which I hadn't coated but they soon cleaned up. The ignition switch started sticking which Yamaha replaced immediately through warranty. In my experience Yamaha are good when it comes to warranty issues. Starts first time and no other issues in 6k. Living on the south coast servicing can be expensive so the annual service varies between £160 - £200 depending where you go. Valve service intervals every 24k (Are you listening Triumph?!) so overall pretty good. Winter riding I get 56mpg and even riding the twisties in 3rd/4th it doesn't drop remarkably. I like simplicity. I'm not interested in TFT's or semi-active this and keyless that, so this has as much technology as I would ever want. The three rider modes do change the throttle response but I leave mine in standard all year round. TC1 is fairly unobtrusive so if wheeling is your thing fill you boots. TC can be turned off. Hepco & Becker for tank bags and SW Motech for side bags I have found to be the best luggage options. Bought from Lamba Motorcycles. All done over the phone and my experience was good. Got an 'ex display' model for £7,500. Bargain. What a bike, what a price! Going over this bike it's difficult to see how Yamaha has done it for the money. Finish is superb with smatterings of aluminium where others would use plastic. The single clock is a piece of design genius and looks the dogs danglies. The engine is brilliant, pulling smoothly from low in the rev range right up to the red line. Weighing only 195kgs, whack it in riding mode A, crack the throttle and watch the world go into reverse while you struggle to keep the front wheel down. Fantastic! (Of course, the throttle goes both ways!). Nice, smooth gearbox with a reassuring 'clunk' when it goes into first. Great extras including riding modes, slipper clutch, ABS and traction control. Some may find the seat a little high at 830mm, I'm 5'7" with 31" inside leg and I can just about get both feet down on the balls of my feet. Bang for bucks, the Yamaha XSR900 defintely delivers. Brakes are ok and give good feedback but could be improved by installing braided lines, I'm being really picky here. After an hour I'm feeling the lack of seat padding and after two hours my backside is screaming for a break. Could no doubt be improved by using an Airhawk. There are some that may find the seat a little high. I'm 5"7" with a 31" inside leg and I can just touch the ground both sides on the balls of my feet. If you're not a confident rider try before you buy. On the upside the XSR handles as well as any bike I've ridden out of the box. It's planted in the twisties and will embarrass a few sports bikes ridden well. For me the engine is the real centrepiece of the bike. It really is a cracking engine and delivers its power all the way to red line so smoothly, it's a joy to ride. Loads of power on tap and there's very little to beat the sound of a screaming triple. No problems at all. My bike is 2-years-old and isn't showing any signs of age. All-in-all, it looks great and hasn't missed a beat. Running costs are about what you'd expect on a bike like this. Not cheap but not pricey either. For a sub £9k bike the equipment on offer is quite astonishing. Three riding modes, perhaps confusingly called B, Standard and A. B mode is effectively rain mode and soften everything off, Standard is where most people will be happiest and A quickens it all up and makes delivery that much sharper. For me, A is where the fun lives. Three traction control levels, if you include switching it off altogether but I'm not really sure why you would on a road bike. Of course ABS is now included as a result of European legislation. Also as standard is a slipper clutch that seems to work great, I can't get the back wheel to lock on down shifts. Bought used from Wigan Yamaha and the overall experience was very good. Everything sorted before I arrived and the bike looked superb. Rides fine, not got the more sophisticated feel of my last bike (ZX6r 636) but perfect for what it is. A lot more comfortable than I thought it would be, and pleasantly surprised with the lack of buffeting from the wind. Great fun bike, & great value too. It's a lot faster than it looks and when well ridden, will keep up with all but the most committed sports bike riders. And when you just want to cruise, it fills that duty equally well. A bike for all moods and modes. Recommended. high quality, firm and planted. Good at doing both commuter and weekend play duty. Love it! Great power and triple thrum. Torque right through the rev range. Well made, good quality parts. No issues to date. Not much 'equipment' on the bike, but it is a naked after all. Luggage options not that clear, off set tank filler makes tank bag selection awkward, saddle bag option limited etc. But if you want a tourer get a Tracer etc. Where i it well equipped is though is things like a slipper clutch, ABS, traction contorl and engine power modes etc. had to change oil twice. did myself at $70 dollars total. no other maintenance costs. 50 miles to the gallon, driven hard. for the dolllar, you get slipper clutch, abs traction control and three drive modes. motorsportsnation in plainfield connecticut, no place better to buy. my sixth bike from them. always take care of you. Utterly brilliant. Grunty, barking acceleration in any gear (steering goes strangely light in 2nd and 3rd) always brings a smile. Effortless overtaking. cheeky burble on the overrun. No problems so far, after 3500 miles - I've not even had to adjust the chain. I keep the bike covered with a healthy dose of anti-corrosion, and a quick wipe down gets it looking like new. Funky clocks are great - everything in one place. 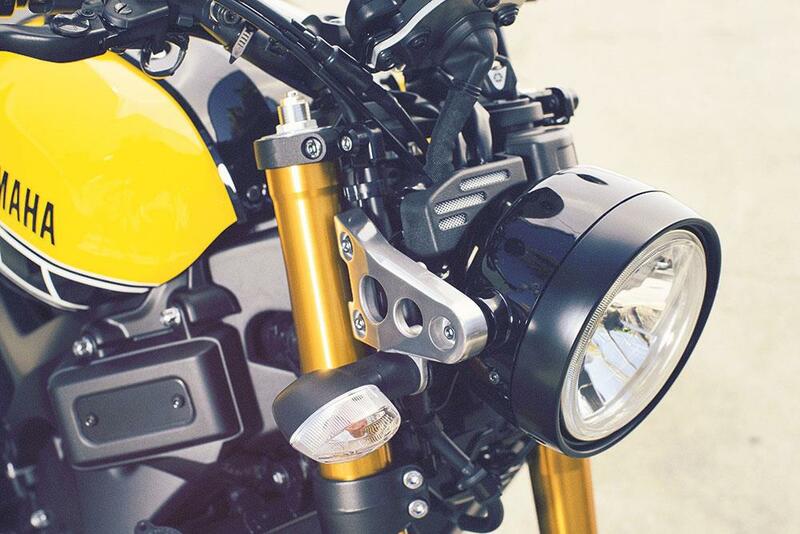 Would love an Akro pipe, but the one that's available is obviously built for the MT, so looks odd on the XSR. Come on, Yamaha. If you're going to get a styling exercise done so well, Yamaha, get a nice round Akro sorted. And give me one for good measure. BUT why no helmet lock? And I'm guessing that the underseat storage area reflects the hazards of smoking, so I'm now only given space for 10 fags instead of 20 on the Fazer. Dealer purchase from Flitwick Motorcycles in Bedfordshire. Friendly. Faultless. I have 100 miles on the new XSR900 and this review is spot on with the exception of the slipper clutch which it also has. This bike is very fun and I was looking at Ducatis and Triumphs, but chose the Yamaha. The only niggle on the bike was the sticker shock for insurance. It's more expensive than the Ducati Multistrada 1200S that is also in the garage. Surprised! Ride is great, a bit stiff, which I prefer. Feels similar to bikes more expensive. There are a couple things that you should know - this is a tall bike for a standard, and feels wider under your back side than a Ducati SF848 or Triumph Street Triple. Haven't really gotten to wick it up yet, but the bike works great under break in conditions. Will get on it a bit more after 1000 miles. Bike is spot on so far. Fuelling, suspension, brakes, etc are all as advertised with no issues. No costs for service so far. 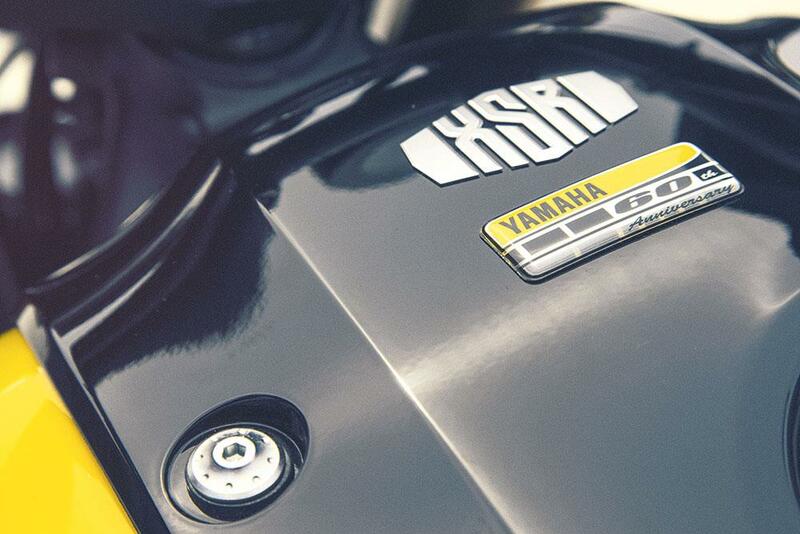 It's a Yamaha and they're known for excellent reliability with proper maintenance. I'll follow the manual and do the first service at 1000 miles which includes an oil change, chain clean/adjust, and clutch cable lube/adjust. Bike is well set up as stock. Features are spot on for what I wanted. Tyres work well, but will likely change them out when ready to another tire - Pirelli or Michelins instead of the stock Bridgestones. Purchased from local dealer who beat all advertised prices. Steve Parrish & Evel Knievel help better your riding! Husqvarna creates one of the best road-going singles we’ve ever ridden.